Airy watercolors and oils, worked with tension, cause dreams, thoughts and feelings. Images which appear to move, captivate with their simplicity. Stella Spanou was born in Amorgos in 1985 and graduated from the School of Architecture of Xanthi in 2008. She attended painting classes by the painter Aris Mavronicolas and sculpture classes by the sculptor and professor of the Fine Arts School of Athens Fika Olympia. 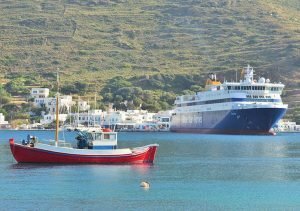 Stella Spanou was running her own gallery in Amorgos the ” Amorgos Art Gallery ”(2011-2015). She has studied in Drama School (2016-2018). Stella Spanou has exhibited her work in Greece (Peraios – Museum of trains,Naxos,Syros, Santorini, Amorgos) and abroad (Rome). Two watercolours of the artist have been awarded at the international art exhibition ”Il Premio Capitolium” in Rome in May 2016.